The first step toward helping your horse is understanding what is known about this condition. This page will give you a basic introduction to headshaking. Headshaking is a condition of horses in which the horse shakes, flicks, or jerks its head uncontrollably without apparent stimulus (without any obvious cause). Headshaking is a worldwide problem, with cases reported in the United Kingdom, France, Switzerland, Australia, New Zealand, South America, and the United States. It has been recognized for many years and in the 1800's was known as "a disease of overfed and underworked horses". It was seen in that era in cart horses working in the city of New York. The first reported case of attempted treatment of headshaking is from 1897. This horse underwent surgery during which the infraorbital nerve was blocked using cocaine and the nerve was cut. This horse's headshaking became markedly worse. The clinical signs seen in these horses can be best explained by neuropathic (nerve) pain mediated by (traveling through) the trigeminal nerve. Neuropathic pain causes burning, tingling, itching, or electric-like sensations and is often intermittent. We and others suspect that these horses are experiencing neuropathic pain with some similarities to the human condition known as trigeminal neuralgia (sometimes called Tic Douloureux). The pain experienced with this condition is a sudden, severe (split-second) pain over the area of the face (cheek and side of the jaw) which is controlled by trigeminal nerve branches known as the mandibular and maxillary branches (the branches that run through/over the jaw and the sinuses). We are continuing to investigate potential relationships between these two conditions. Blocking the originating branches (the place where the nerve first splits) of the trigeminal nerve stops headshaking signs in many horses. Although cutting this nerve (a procedure known as a neurectomy) sounds promising, this treatment has been effective on only about 30% of the horses which undergo the procedure, and any relief can be temporary. In addition, some horses suffer very bad side effects or even worse headshaking following the procedure. Remember the case mentioned above from 1897? Therefore, even though the problem likely lies in the nerve, cutting the nerve is a bad idea. The pain associated with headshaking can be constant, intermittent or even seasonal. The photic sneeze response in humans could explain why this happens. People who experience photic sneezing feel a tingling or itching-like sensation and then sneeze in response to going from the dark to bright sunlight. These horses tend to exhibit symptoms seasonally. They are sensitive to light from both the sun and from artificial sources (indoor lighting). They often seek shade and may exhibit signs only at rest or only during exercise. Individual headshakers appear to experience symptoms as a result of different stimuli (their symptoms are brought on by different things) but, regardless of the trigger, the resulting behavior is the same. Think of this as similar to migraine sufferers: what causes migraines is different for each person who suffers from them and treatments that work for one person don't work for another. Trigeminal Mediated Headshaking: It is our opinion that most headshakers are "trigeminally" mediated (caused by abnormal function of the trigeminal nerve system). 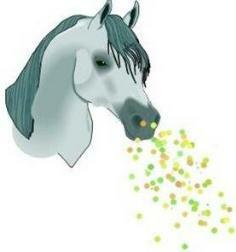 Put simply, the trigeminal nerve carries signals that cause the horse to headshake (refer to the diagram below). Photic headshakers are a subset of headshakers whose symptoms are stimulated (brought on) by exposure to bright light e.g. sun-light. Why Can Exercise Trigger Headshaking? Headshaking can occur with or without a rider and with or without tack. We have identified tack-associated headshaking-like behavior, but that is not a trigeminal nerve disorder and is much less common. Exercise causes many physiological changes that occur via the autonomic nervous system, including nasal turbinate vasodilation (the blood vessels get bigger), vagal nerve changes (heart rate changes, sweating), etc. This may cause an unstable trigeminal nerve system to send (fire) inappropriate signals to pain perception areas in the brain. Hence, the horse percieves pain from normal, nonpainful activities.